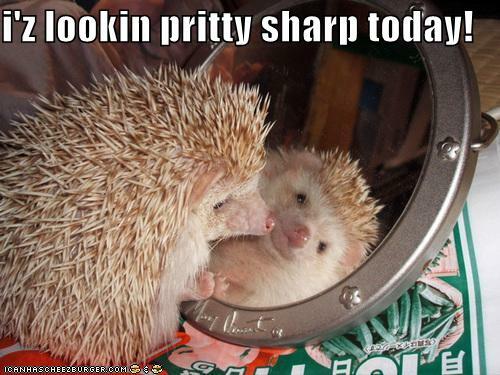 Hedgehogs are small spiny mammals that eat insects, frogs, berries, and even worms. 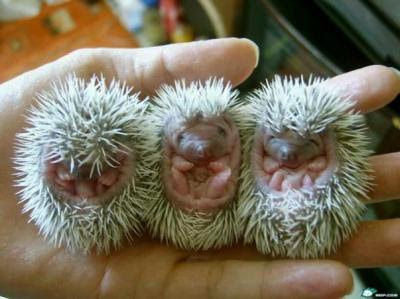 Unlike porcupines, their spines are fixed on their back so when they roll in a ball, they are prickly all over. 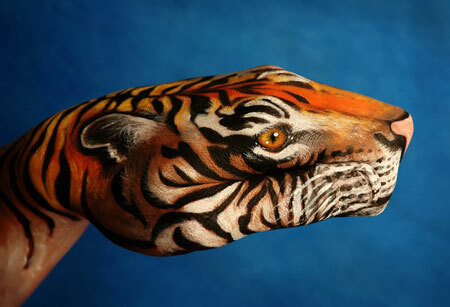 Big Cats hand art...and more! 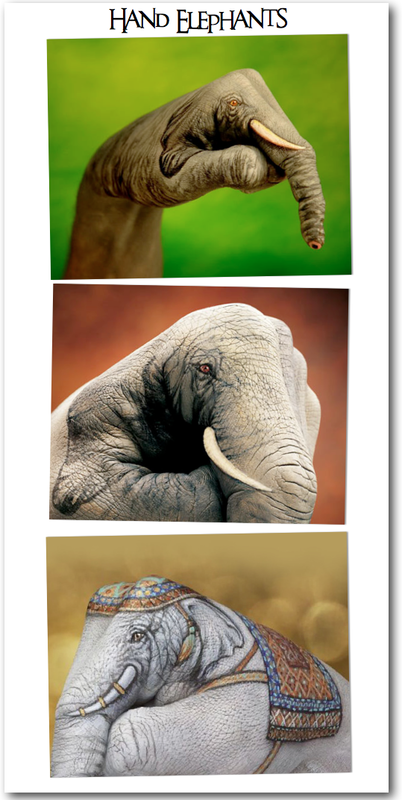 Here are some animals we've studied...painted on hands! I have a thing for zebras (since I wrote a book about them), so I like the zebra best. Can you name the first two big cats? So, you ready? It's test time and it will be eeeezeeeeeeee. 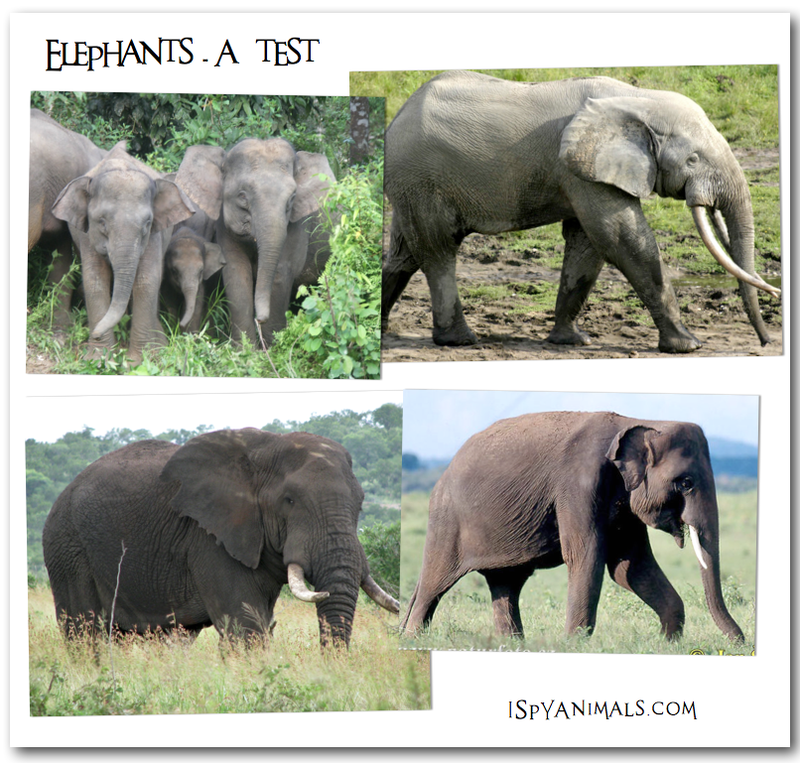 Look at and identify each elephant type, then scroll down and check your answers. I told you it would be easy! Leave a comment to tell me how you did. Now get out there and do some elephant stalking at your zoo, movie night, or nearest savanna...you know what to look for! 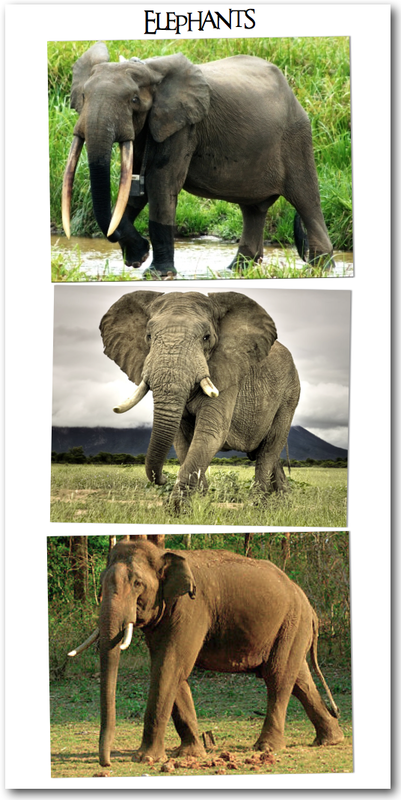 The Magnificent Seven: giant tuskers! The largest, longest, heaviest tusks ever recorded are the Kilimanjaro Tusks, pictured above. At over 10 feet in length, the tusks weigh 237 and 225 lbs respectively. White elephant...not just a party gift! They do exist in nature. 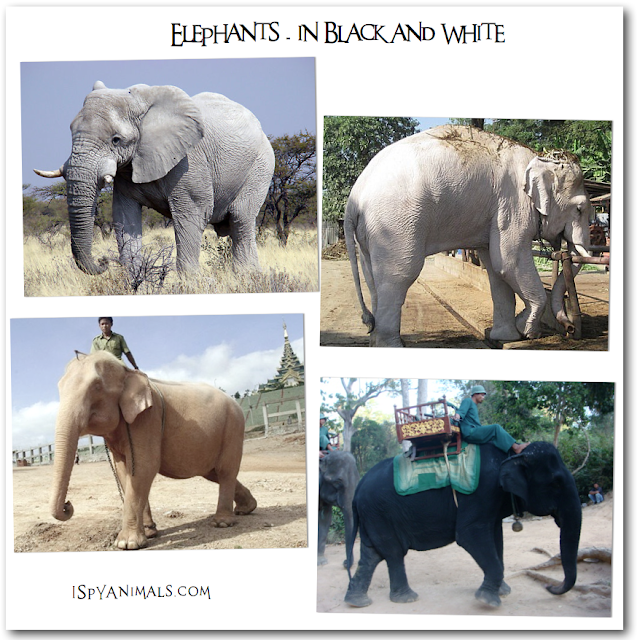 And so do black and leucistic elephants. Here are photos of some! Below is a video of an albino baby elephant. You will see its light color and pink eyes toward the end of the video, so feel free to fast forward. Pretty cute! Known as the Pygmy elephant, this guy lives in the rain forests of Borneo. He has the smaller ears and the convex back of the Asian elephant and was once thought to be just a smaller version of that animal. His height? A full three feet shorter than an average African elephant...about 7 feet tall! A Pygmy elephant is unusually gentle, but also in danger of extinction. Why? 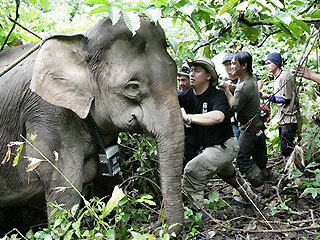 The Borneo forest is being converted to palm oil plantations...and Pygmy elephants love palm oil like kids love candy! So plantation owners destroy the elephants for eating their palm oil. But one man, Bert Dausip, is trying to save them. Watch his documentary on how he tracks, observes, and attempts to save the Pygmy elephant in "Borneo's Pygmy Elephant" (link below). Elephants have been painted on for thousands of years. In the past, they were painted for war! 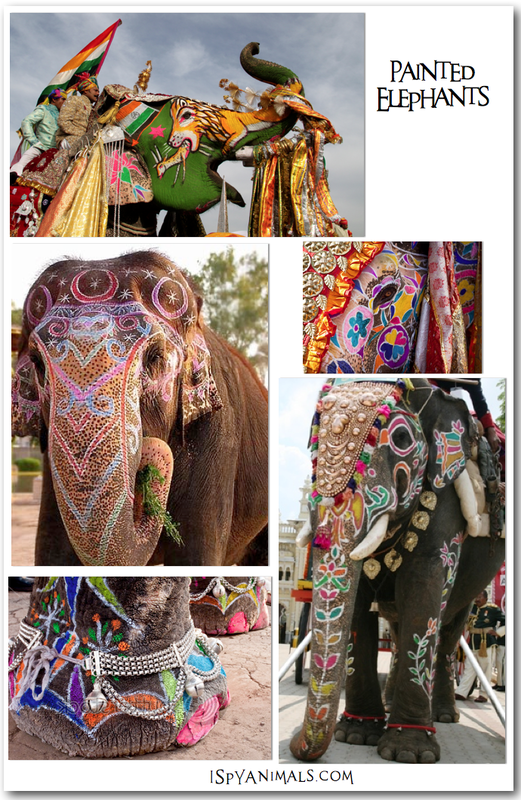 But today elephants are painted and decorated for festivals, ceremonies, and just for display. 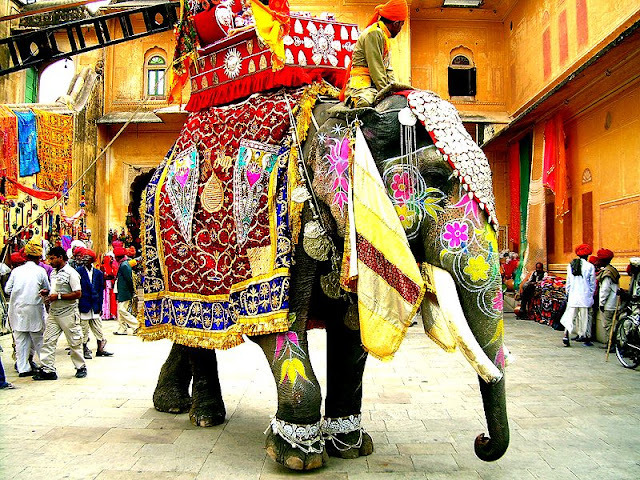 There is an Elephant Festival in Jaipur, India, which begins with a beautiful procession of bedecked elephants. 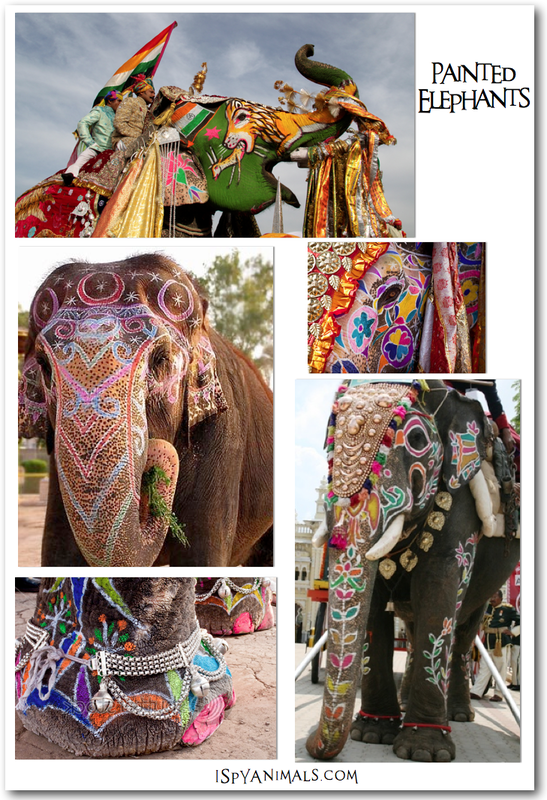 The owners proudly embellish their elephants with vibrant colors, embroidered saddle cloths, and heavy jewellery. 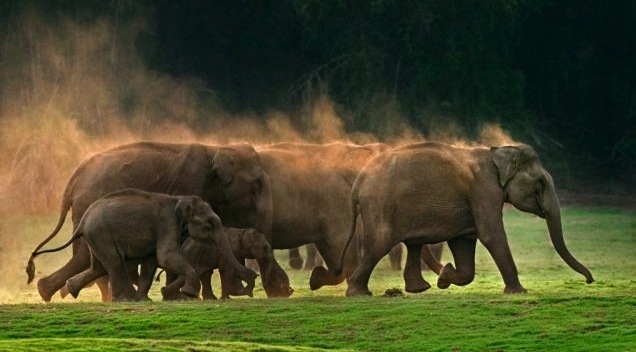 It is quite a treat to see female elephants wearing anklets, which tinkle as they walk. An award goes to the most beautifully decorated elephant! Elephant polo, elephant races, and a tug-of-war between an elephant and 19 men are the featured events of the festival. 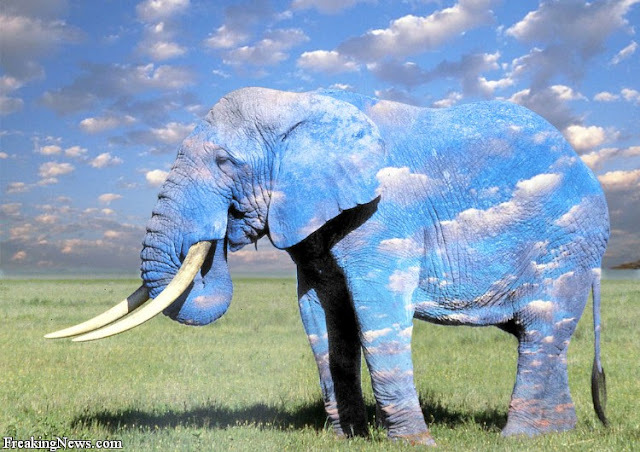 I think painting on an elephant would be fun and creative...but a lot of work! What do you think? 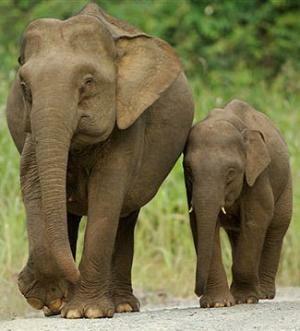 The Asian elephant is an endangered animal. Elephants can walk. They can also walk faster. But they can't run or jump, gallop or trot. But don't get any ideas; an elephant walks faster than you can run! So it's good to be able to tame an elephant, but the only one that can be tamed is the Asian elephant! 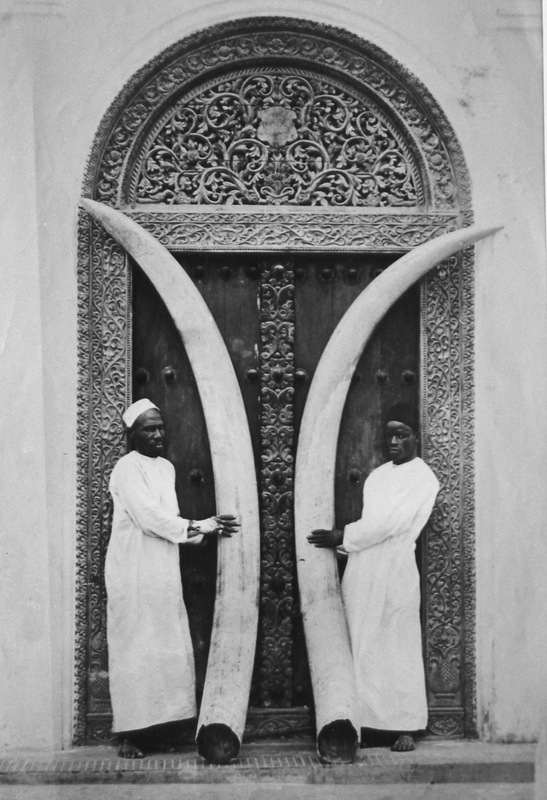 This elephant has been used for heavy labor, hunting, war, and transportation. Check out the picture at the top. The Asian elephant has a keeper, or mahout, seated on its neck to control the elephant, while the howdah on its back carries passengers. Stay tuned for the beast that some think should be named the fourth type of elephant... and watch for "the elephant as art"! 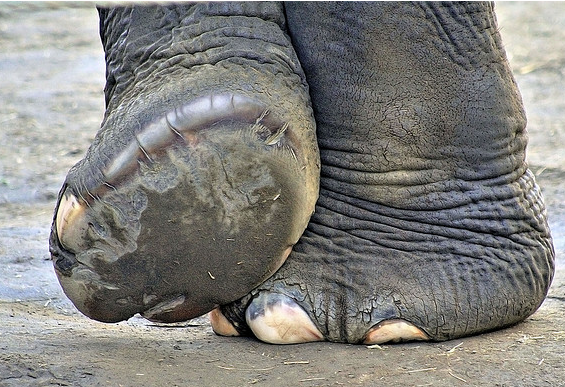 Did you know that counting the number of toenails on an elephant can help identify it? 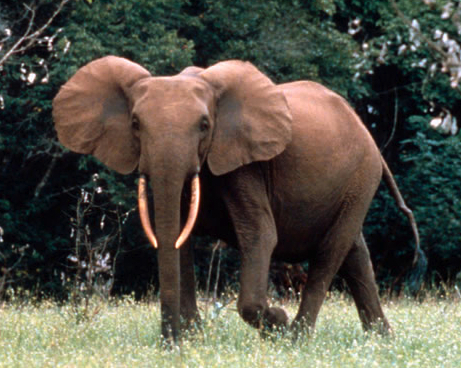 That's because the African Forest elephant has more toenails than the Bush elephant! Front foot & back foot toenail count is 5 and 4 compared to Bush's 4 and 3. Next post, we'll look at the our last of the species, the Asian elephant. But, shhhhh, there's one more elephant that some scientists think should be the fourth elephant in the family! 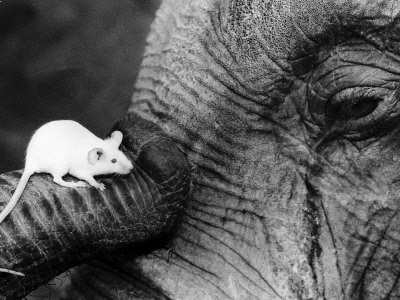 Elephants are afraid of mice...you've heard that before. It's a cute idea in stories, but not true! The largest elephant ever was 13 feet high...that's three feet higher than the average ceiling! And guess which type of elephant that was? 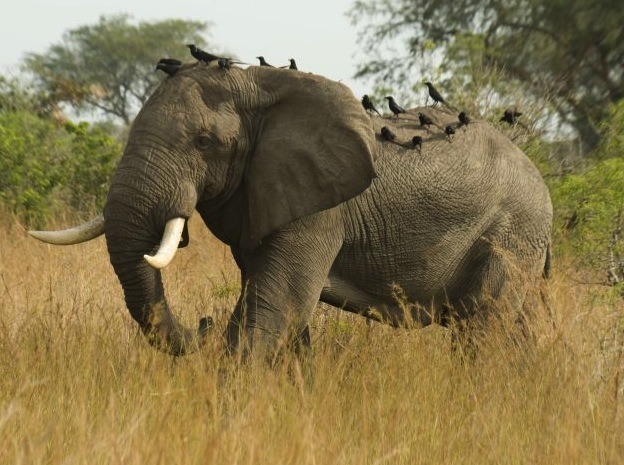 The largest of the large...the African bush elephant! 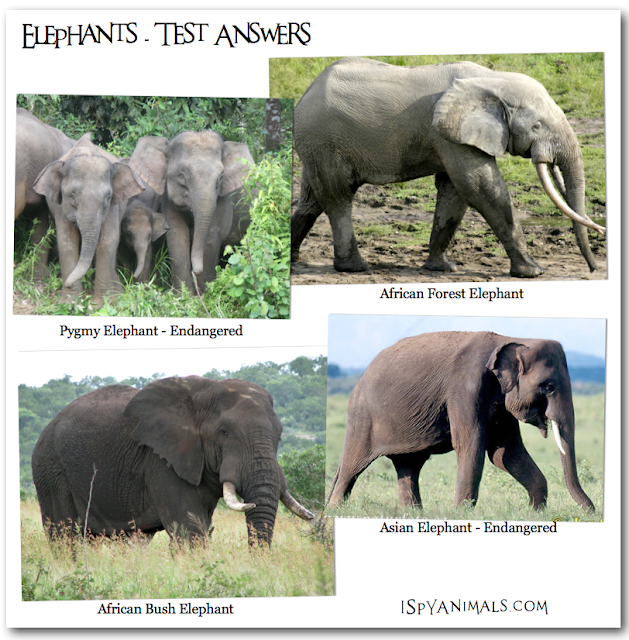 Next post, we'll take a look at the forest elephant and discover the differences between both types of African elephant! 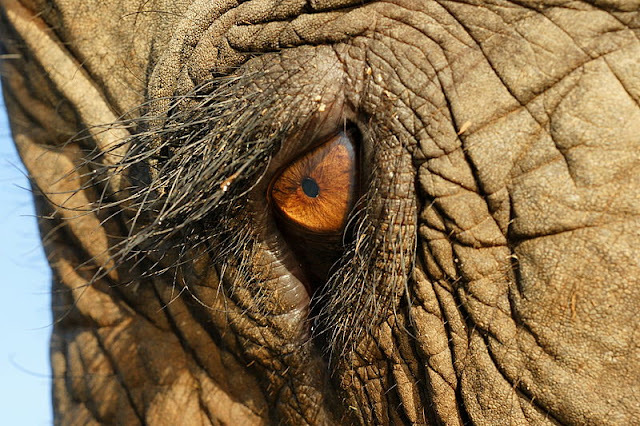 This wonderful golden eye belongs to an elephant, an amazing animal who is as smart as a dog or dolphin! But to get you started, I have pictures of the three types that exist today...what differences can you see in them?